Humanity’s grand experiment in the atmosphere continues, and a new report documents just how far it’s gone. On Tuesday, the National Oceanic and Atmospheric Administration released its annual index of 20 key greenhouse gases. It shows that their direct influence on the climate has risen 140 percent since 1750, with 40 percent of that rise coming in just the past 26 years. That increase is almost entirely due to human activities and has caused the planet to warm 1.8°F (1°C) above pre-industrial temperatures. Carbon dioxide is responsible for 54 percent of the overall increase in climate warming seen since 1990. The index takes greenhouse gas measurements from about 80 ships and observatories around the world—gathered in all their parts per million and parts per billion glory—and boils them down into a simple numerical index. This year’s number: 1.4. It’s a simple number that contains multitudes. For example, carbon dioxide is responsible for 54 percent of the overall increase in climate warming seen since 1990. The four other major greenhouse gases in the index, which include nitrous oxide, methane and two types of chlorofluorocarbons, are responsible for 42 percent of the increase with 15 minor greenhouse gases accounting for the missing 4 percent. Carbon dioxide has risen rapidly in the atmosphere, with 2016 marking the second-largest annual increase ever observed at the Mauna Loa Observatory, the world’s main measuring station. 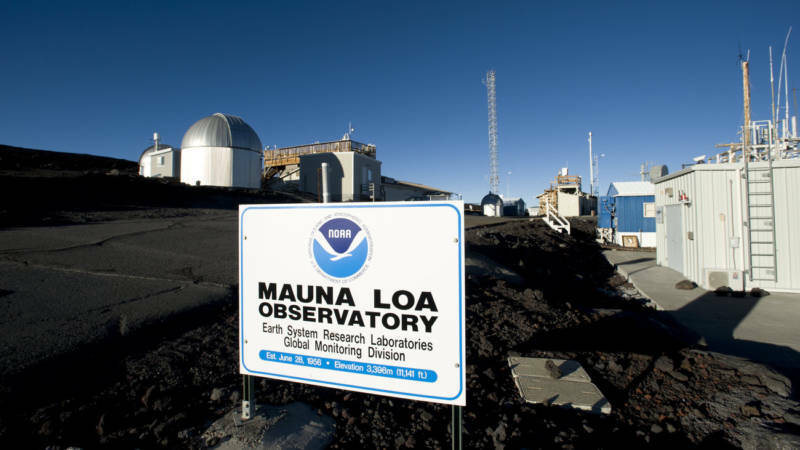 This May, monthly carbon dioxide peaked at 409.65 parts per million. That’s a record high and a mark unseen in human history. If emissions continue on their current trend, the atmosphere will hit a state unseen in 50 million years. A bright spot in the report is the decline of chlorofluorocarbons’ warming influence on the planet. The chemicals were commonly used as refrigerants until the Montreal Protocol banned them in 1989. The treaty came about because they deplete the protective ozone layer, but phasing them out has also helped reduce their warming impact on the climate. Even with their decrease, there are still a lot of greenhouse gases swirling in the atmosphere and trapping more energy on the planet’s surface. Michael Mann, a Penn State climate researcher, said the change in the amount of energy being trapped by all the extra greenhouse gases is roughly the equivalent of adding a Christmas tree light to every square yard around the world since 1982. “(It) might seem small but it's not. That alone is enough to raise Earth’s temperature by roughly 1.5°F,” he said in an email. Aerosols — light reflecting particles — and the slow nature of the earth’s climate to reach equilibrium are the main reason the planet hasn’t warmed that much since 1982, the first year in Mann’s calculation. Carbon emissions have held steady the past three years after rising nearly every year since the Industrial Revolution. That plateau still means humans are putting tons upon tons of carbon dioxide and other greenhouse gases in the atmosphere, further altering it. The world only has a finite amount of greenhouse gases it can safely put in the atmosphere. Researchers recently warned that emissions need to begin declining in the next three years in order to have a chance of limiting global warming to within 3.6°F (2°C) of pre-industrial temperatures. The 1.8°F (1°C) of warming fueled by greenhouse gas pollution has already caused seas to rise nearly a foot, Arctic sea ice to vanish at a quickening pace and made some extreme weather more likely and extreme. Low-lying small island states and coral ecosystems could vanish if warming hits 2.3°F (1.5°C). Passing the 3.6°F (2°C) threshold would put humanity outside the “safe” range of warming outlined by policymakers and scientists.